Move over Bali, Hainan, Jeju, Koh Samui and Phuket, here comes Vietnam’s Phu Quoc Island as a competitor in the Asia race for the most beautiful paradise island. Phu Quoc, the largest island in Vietnam, located off the tip of Vietnam’s south coast, about 30 miles from the Vietnamese mainland an hour’s flight from Ho Chi Minh, is surrounded by 26 smaller islands in the Gulf of Thailand. Phu Quoc is a haven for nature and sea lovers looking for a distant place to unwind with family or whoever. The island is considered “off the beaten track” as it remains remarkably undeveloped. With more than a dozen bays and beaches, some yellow sand, others brilliant strips of white, an archipelago of islets off its south coast, a jungle-covered interior and a handful of fishing villages, the island has something for everyone, whether you want to go scuba diving, fish for trout, play golf in stunning natural surroundings, climb a sacred mountain or trek through the dense virgin forest, the island has it all and will reinvigorate the body and refresh the soul. Surrounded by 100 hectares of majestic woods within the National Park, Vinpearl Phu Quoc Golf Club, the first 27-hole course on island, adds yet another brilliant stroke into the picturesque scene on Phu Quoc island and brings out the best of what this tropical paradise has to offer. 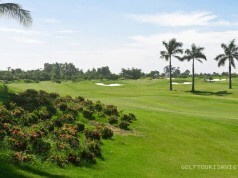 The course property has a unique setting and terrain, IMG Worldwide which is considered one of the premier golf course design companies in the world, has made great use of the natural beauty by utilizing the topography of the site while taking full advantage of the movement of the terrain. Every element of the land is taken under careful consideration including elements such as water and predominant wind pattern. As a result, the course present a variety of risk/reward challenges that draw golfers of all skill levels to play them again and again. 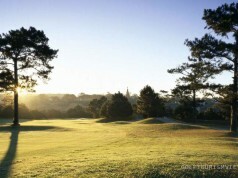 Each hole is a unique challenge creating unmatched satisfaction and a memorable experience for the golfer. Golfers can experience the rolling fairways and contours that weave and undulate seamlessly through the beautiful landscape. The course commands a breathtaking, panoramic vista of the tropical forest against the stunning backdrop of the pristine East Sea. The par-3 signature 3rd hole is one of the most challenging and appealing hole as it has been dubbed the “Window on the Sea” for its remarkable ocean view and it requires techniques of golfers to overcome lots of challenges of trees, sand and water. 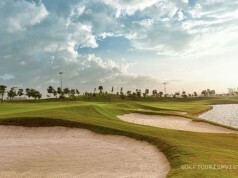 Players can hone their skills at the full sized practice facility that includes all grass teeing area, putting and chipping greens, and two large bunkers. The modern and well-equipped clubhouse offers a stylish relaxed restaurant and bar that is a perfect place to meet up before your game, or kick back and relax afterwards, with a wide array of snacks and refreshments. Also housed in the Clubhouse is a fully stocked Pro Shop, lockers and change rooms together with friendly and professional team that is always completely available to assist. Address: Phu Quoc Island, Vietnam. Keyword: vinpearl golf, vinpearl golf club, vinpearl golf club phu quoc, vinpearl phu quoc golf.